AG600LH - G & W Machinery Sales, Inc. 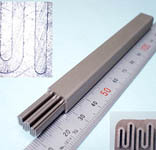 The AG600LH Wire EDM includes Sodick’s Linear Motor Technology. The AG Series is where speed meets accuracy. 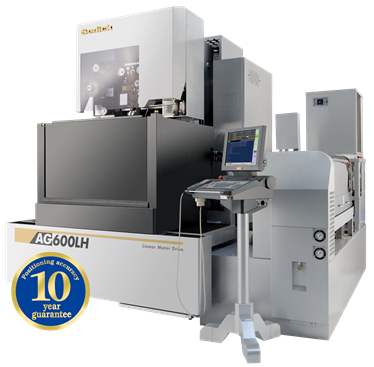 The AG600LH Wire EDM includes the same features and benefits as the AG600L, but with extra height making the AG600LH have a unique height for its size. Sodick's Linear Motor Driven Wire EDMs have no backlash and are vibration-free, this results in machining accuracy combined with a fine surface finish. Sodick’s AG600LH linear motor driven, high precision wire EDM features new user-friendly EDMing technology, this technology further enhances productivity and EDM precision. The machine’s linear motor axes drives are coupled with .4 millionths Heidenhain absolute glass scale feedback on the X, Y, U and V axes which ensures precision cutting and positioning accuracy. Sodick’s X, Y, U and V linear motor drives have no backlash and are backed by Sodick’s 10-Year Positioning Accuracy Guarantee. With the Heidenhain ultra-precision absolute linear glass scales, the true machine position is always known. This reduces set-up time since the operator no longer has to home the machine after is has been powered down. The AG600LH Windows XP based, high speed control comes standard with a large 15.1” LCD touch screen which is easy to view and eliminates glare. Standard items; such as, the LAN network connection and a 1GB USB memory stick make it easy to transfer programming files. The 4 GB compact flash card memory eliminates hard drives which can crash resulting in lost data, the UPS system will automatically lock the axes drives. Once power is restored, the machine will automatically power itself up and resume cutting. The Heart NC on-board, user-friendly programming software is beneficial for shops that are on a tight budget. Heart NC can program both 2 and 4 axes shapes and import CAD files. After programming, the user-friendly Condition Set Screen will automatically select the optimum cutting conditions and offsets from its internal database and add them to the NC program. The AG Series features energy-saving designs and technologies. Compared to conventional Wire EDMs, the Sodick Wire Electrical Discharge Machine Range can reduce average energy consumption by up to 60%. The new high speed, automatic, annealing wire threader improves wire straightness which increases the AWT repeatability especially at larger Z heights, especially heights such as on the AG600LH Wire EDM. During the annealing process, the wire is heated, stretched and cut to a sharp point resulting in a smaller required wire guide clearance improving part accuracy. Since the annealing AWT can thread in the submerged mode, the worktank does not have to be drained when wire threading. The Z axis position will automatically set the dielectric fluid for the operator.